Last Monday NEVS presented the first 9-3 of model year 2014. We are very happy that we got the ok to print a poster of that very model that is now available in the SaabsUnited-Store on caryourcar.eu. Not only that it is a special car, I personally love the color cobination of that picture – classic black and yellow. In addition to that new product the poster sale has been extended to the entire rest of the portfolio. Check it out here. Since today the first door is to be opened we decided to sell off the last pieces of our SaabsUnited Advent calendar at heavy discount. It is now available for Euro 5,90 instead of 9,90. Whilst you are visiting cardyourcar.eu and the SaabsUnited Store don’t miss our other products. Besides a wide range of posters we also offer a bit of seasonal stuff like Christmas cards, wrapping papers and even two different sleds. We also have the European license plate frames back in stock and a few of the known SaabsUnited keyrings along with the decals the crew had on their cars on the Saab Festival. Be aware that the 10% discount can still be obtained with the code SAABXMAS until the 24th of December. Cardyourcar’s Special XMAS offer, 10% discount! We at SaabsUnited knows that Christmas is a very hectic time of the year. And sometimes there’s just not enough time to chase after those extraordinary gifts for our loved ones. Are you looking for a really special Christmas gift this year? Or do you want to spoil yourself for Christmas? We have the goodies! And we also offer you a 10% discount on ALL our items at cardyourcar.eu. In our shop you will find products which are specially selected and made for Saab enthusiasts. We have goodies such as calendars for 2014 (in three different designs), posters (some of the posters are also on Sale! ), t-shirts, etc. And we also have suitable Christmas wrapping paper and Christmas cards for the goodies you want to wrap, to make the gift even more special for that special someone (or yourself..). Check out our selection of SAAB goodies here, and enter the code “saabxmas” at the checkout point and receive the 10% discount. The discount is valid on all our items in the shop, including the sale items. Expiry date is the 24th of December. We hope you enjoy what we created. The calendars are entering stock today and the new as well as the pre-orders wil be made ready for shipping over the weekend. And of course feel free to browse around a bit on cardyourcar and explore the other products. It’s been just a few weeks ago that NEVS built the first 9-3 under their ownership in the Trollhättan factory. Our photographer Rikard H made that great shot that we now printed as a poster. It_s available in the SU store area on cardyourcar. We created another set of great posters in cooperation with Abel Art from Singapore. They are available either as a set or seperately. To celebrate the new additions to our poster portfolio we give a 50% discount on all other posters. Check it out, along with lots of other stuff like SaabsUnited T-Shirts, decals and the Advent Calendar a on cardyourcar.eu. The SaabsUnited Advent calendar really sweetens the wait for Christmas. On the outside if features a beautiful 9-3x in the snow and on the inside there are 24 bars of Milka chocolate waiting for their day to come. With a size of 27 x 19 x 1 cm (approx. 10,6 x 7,5 x 0,5 in) and a foldable stand on the back it is perfect for the office desk. That advent calendar is strictly limited to 250 pcs so don’t think about it for too long. Feel free to browse through cardyourcar. Of course you can cross-shop all the articles there and get it all in a single delivery. Even a first glimpse on the new SU calendars is available. They have just been made available for pre-orders. More on them later this week. SAABSUNITED has been busy as of late brainstorming and coming up with SAAB related goodies to offer for sale to the SAAB community. What has been overwhelmingly obvious with the orders already received is that people want SAAB stuff and the unfortunate is that there hasn’t been much to chose from for a while. We are working to change that and you will see more come available in the new year as we work to fill the void. With the busy hustle and bustle that can be the Christmas season, we want to remind people that if they would like to order from what we have available now, you should still make deliveries for Christmas. I know from talking with Till that all calendars that have been ordered to this point are already on their way and on my side, all of the SU plate frames for North America are also on their way. So that being said, any orders received going forward will be sent right away to try to get to their destinations for Christmas. Below are the links to order the mioh calendars, the SU calendars and the SU North American plate frames which can be ordered in the store or right here. For those calendars the postal delivery takes approx. 1-2 (work)days for Europe and 3-6 days for the rest of the world while the frames need approx. 2-5 days. Just to give you an idea if your order can be there for christmas. 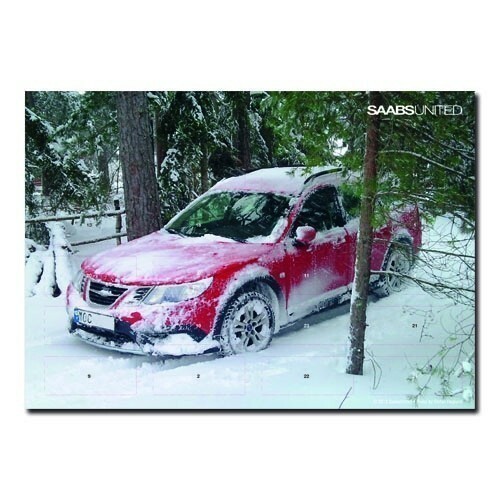 The latest additionto our calendar portfolio features Saabs on the move using photos by the Swedish photographer mioh. You can either order it seperately or as a set with both SU calendars at a discounted price. 2013 SAABSUnited calendars are here and ready to order. To order simply hit the buy now button below the photo and you will be directed to the PayPal checkout screen. You can order one or all with a discount if buying both. Prices are € 11.50 each or € 20.00 for both. These are the Brand new SAABSUNITED North American license plate frames. These plate frames are available for purchase through the buy now PayPal button below only as they are available through our North American distributor. When directed to the PayPal login screen you will be able to purchase one or more of these plate frames at a cost of $15 per frame including shipping. The plate frames will be coming from Canada to your North American destination which should allow for quicker delivery once your payment has cleared. Please use the notes section of your PayPal order for any special notes. Because some states and provinces have certain laws about back plate frames, we will call these frames front plate frames. While I was busy sorting the pics that were sent in for the SU calendar(s) I got in touch with a Swedish photographer who is, at least in his home country, well known under his pseudonym mioh. I liked the pics he sent and we were chatting about making a dedicated calendar using some of his pics. The huge success of the SU calendars delayed the finalizing of this one a bit but I like it too much not to bring it on. It’s a bit more of an art calendar, printed on a very nice, silky paper. The size is A4 (29,7×21 cm). It can be ordered through the SU store at a price of Euro 13,50 or as a three piece set with the SU calendars at a price of Euro 32,00. As before, shipping will be a flatrate of Euro 3,70. If any of you wants to order one SU calendar with this one please make two orders, I will refund one shipping fee. Otherwise we would have to set too many paypal buttons here. On a sidenote, all orders up to today have been shipped now, things have delayed a bit as I visited Sweden at the end of last week. A bit more on that visit will follow later this week. If you have any inquiries or questions on the calendars please contact me directly through till72(at)saabsunited.se.